This image displays a global distribution of 45 hotspots including Iceland. The eruption of Laki in 1783 caused much devastation and loss of life, leading to a famine that killed approximately 25% of the island's human population and resulted in a drop in global temperatures, as sulfur dioxide was spewed into the Northern Hemisphere. This caused crop failures in Europe and may have caused droughts in India. The eruption has been estimated to have killed over six million people globally, making it one of the deadliest volcanoes, with Tambora being number one. In the period from 1963 to 1967, the new island of Surtsey was created on the southwest coast by a volcanic eruption. Since Iceland is located atop the Mid-Atlantic Ridge, some scientists believe the hotspot beneath Iceland could have contributed to the rifting of the supercontinent Pangaea and the subsequent formation of the Northern Atlantic Ocean. This is because igneous rocks have been found on both sides of the Mid-Atlantic Ridge from the hotspot beneath Iceland, which originated 57-53 million years ago, around the time North America and Eurasia separated and seafloor spreading began in the Northeast Atlantic. Geologists can ascertain some information about plate motion relative to the Icelandic hotspot by examining igneous rocks throughout the Northern Atlantic region. This is since certain rocks attributable to hotspot volcanism can be interpreted as volcanic traces left by the Iceland hotspot. By assuming hotspots locations do not change with time, geologists use what is called the "hotspot frame of reference" to gather plate motion estimates and to create maps depicting plate movement on the surface of the Earth relative to a stationary hotspot. Most research discussing plate motion agree that the Iceland hotspot was probably located beneath Greenland for a period of time. As the North Atlantic Ocean continued to spread apart, Greenland was located to the southeast of the Iceland hotspot and likely moved over it between 40-70 million years ago. Some research using new plate motion data gathered from hotspot reference frames from around the world suggests that the Iceland hotspot's path differs from older investigations. Many older rocks (dated 75-70 million years ago) located throughout the area to the west are not only located near hypothesized Iceland hotspot paths but are also attributable to hotspot volcanism. This implies a plausible case for the Iceland hotspot being much older than the earliest rifting of what is now the northernmost Northeast Atlantic. If such a hypothesis is true, then much of the rifting in the North Atlantic was likely caused by thinning and bulging of the crust as opposed to more direct influence by the mantle plume which sustains the Iceland hotspot. In other scientific work regarding the path of the Iceland hotspot, no such westward track toward Canada (where the aforementioned older igneous rocks exist) can be detected, which implies that the older igneous rocks found in the Northern Atlantic may not have originated from the hotspot. Although the exact path of the Iceland hotspot is debated, a preponderance of geophysical evidence such as the geothermal heat flux over Greenland shows that the hotspot likely moved below Greenland from approximately 50-80 million years ago. Around 50-60 million years ago when Iceland was located near the eastern coast of Greenland and the Mid-Atlantic Ridge, volcanism, potentially generated by the Iceland hotspot, connected the Eurasian and North American continents and formed a land bridge between the continents while they spread apart. This feature is known as the Greenland Scotland Transverse Ridge, and it now lies below sea level. Approximately 36 million years ago, the Iceland hotspot was fully in contact with the oceanic crust and possibly fed segments of the Mid-Atlantic Ridge which continued to form the oldest rocks located directly to the east and west of modern-day Iceland. The oldest sub-aerial rocks in modern-day Iceland are from 16.5 million years ago. Although most scientists believe Iceland is capable of being an island because it is both in contact with a mantle plume, and being actively split apart by the Mid-Atlantic Ridge, some other convincing seismological and geophysical evidence calls the previously discussed mantle plume/hotspot assumption into question. Some geologists believe there is not enough definitive evidence to suggest a mantle plume exists beneath Iceland because seafloor heat flow through the lithosphere surrounding Iceland does not deviate from normal oceanic lithosphere heat flow that is uninfluenced by a plume. This cold crust hypothesis directly opposes the idea that Iceland is located beneath a hot mantle plume. Additional evidence indicates that seismic waves created under Iceland behave differently than expected based on other seismic surveys near hypothesized mantle plumes. Given the fact it is one of the only places seafloor spreading can be observed on land, and that there is evidence for a mantle plume, the early geological history of Iceland will likely remain a popular area of research. One of the rare examples of sedimentary rocks in Iceland is the sequence of marine and non-marine sediments present on the Tjörnes Peninsula in northern Iceland. These Pliocene and late Pleistocene deposits are composed of silt and sandstones, with fossils preserved in the lower layers. The primary fossil types found in the Tjörnes beds are marine mollusk shells and plant remains (lignite). The tectonic structure of Iceland is characterized by various seismically and volcanically active centers. Iceland is bordered to the south by the Reykjanes Ridge segment of the Mid-Atlantic Ridge and to the north by the Kolbeinsey Ridge. Rifting in the southern part of Iceland is focused in two main parallel rift zones. The Reykjanes Peninsula Rift in SW Iceland is the landward continuation of the Reykjanes Ridge that connects to the Western Volcanic Zone (WVZ). The more active Eastern Volcanic Zone (EVZ) represents a rift jump, although it is unclear how the eastward propagation of the main rifting activity has occurred. The offset between the WVZ and the EVZ is accommodated by the South Iceland Seismic Zone, an area characterized by high earthquake activity. The EVZ transitions northward into the Northern Volcanic Zone (NVZ), which contains Krafla volcano. The NVZ is connected to the Kolbeinsey Ridge by the Tjörnes Fracture Zone, another major center of seismicity and deformation. Glaciers cover approximately 11% of Iceland, the largest of which being Vatnajökull. As many glaciers overlie active volcanoes, subglacial eruptions can pose hazards due to sudden floods produced by glacial meltwater, known as jökulhlaups. Icelandic glaciers have generally been retreating over the past 100 years, with Vatnajökull having lost as much as 10% of its volume. ^ Tobias Weisenberger (2013). "Introduction to the geology of Iceland". ^ "Catalogue of the Active Volcanoes of the World, Vol. 24" (PDF). Archived from the original (PDF) on 2013-11-13. Retrieved 2012-08-01. ^ a b c d Müller, R. Dietmar; Royer, Jean-Yves; Lawver, Lawrence A. (1993-03-01). "Revised plate motions relative to the hotspots from combined Atlantic and Indian Ocean hotspot tracks". Geology. 21 (3). doi:10.1130/0091-7613(1993)021%3C0275:rpmrtt%3E2.3.co;2. ISSN 0091-7613. ^ a b O'Neill, Craig; Müller, Dietmar; Steinberger, Bernhard (April 2005). "On the uncertainties in hot spot reconstructions and the significance of moving hot spot reference frames". Geochemistry, Geophysics, Geosystems. 6 (4): n/a–n/a. doi:10.1029/2004gc000784. ISSN 1525-2027. ^ a b Martos, Yasmina M.; Jordan, Tom A.; Catalán, Manuel; Jordan, Thomas M.; Bamber, Jonathan L.; Vaughan, David G. (2018-08-24). "Geothermal Heat Flux Reveals the Iceland Hotspot Track Underneath Greenland". Geophysical Research Letters. 45 (16). doi:10.1029/2018gl078289. ISSN 0094-8276. ^ Stein, Carol A; Stein, Seth (February 2003). "Mantle plumes: heat-flow near Iceland". Astronomy and Geophysics. 44 (1): 1.08–1.10. doi:10.1046/j.1468-4004.2003.44108.x. ISSN 1366-8781. ^ Foulger, G. R.; Du, Z.; Julian, B. R. (November 2003). "Icelandic-type crust". Geophysical Journal International. 155 (2): 567–590. doi:10.1046/j.1365-246x.2003.02056.x. ISSN 0956-540X. ^ Einarsson, Páll (2008). "Plate boundaries, rifts and transforms in Iceland" (PDF). Jökull. 58: 35–58. 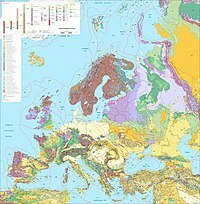 Wikimedia Commons has media related to Geology of Iceland. Trønnes, R.G. 2002: Field trip: Introduction. Geology and geodynamics of Iceland. In: S. Planke (ed.) Iceland 2002 – Petroloeum Geology Field Trip Guide, prepared for Statoil Faroes Licence Groups by Volcanic Basin Petroleum Research, Nordic Volcanological Institute and Iceland National Energy Authority, p. 23-43. Bamlett M. and J. F. Potter (1994) "Iceland". Geologists' Association Guide No.52. Interview of geologist Gro Birkefeldt Møller Pedersen about Iceland's geology, in particular its volcanoes. This page was last edited on 15 April 2019, at 10:10 (UTC).